Story: After Griffin killed Wicksteed and was hunted by Dr. Kemp and the police  he tricked another person (a halfwit) into taking the invisibility potion. While the unfortunate person who took the potion was killed, Griffin escaped and started drifting around. He eventually ended up hiding in Miss Rosa Coote's Correctional Academy for Wayward Gentlewomen, where he took advantage of the young women. At the school they thought he was a spirit and the pregnancies were immaculate conceptions, until Mina Harker and her companions came and took him away for the League of Extraordinary Gentlemen . Griffin was promised a pardon and the possibility of a cure if he joined, which he did . When the Martians attacked Earth, Griffin expected the Martians to win and betrayed Earth and his companions in the league. He revealed himself when he attacked Mina Harker, and ran off to the Martians with the map of London's defenses . 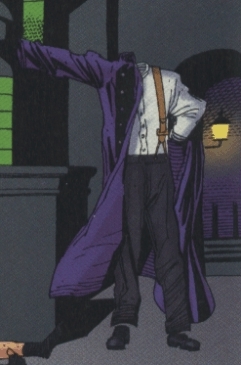 Griffin died when Edward Hyde raped and beat him to death in the league's headquarters . Skills & abilities: Griffin's body was invisible. The process was irreversible and he could not make other objects invisible. Background notes: Hawley Griffin is the character created by H.G. Wells in the book "The Invisible Man". In the book, Griffin was killed in the end and turned visible. In Alan Moore's version he had survived somehow. When The League of Extraordinary Gentlemen (LXG) was released as a movie in 2003, the Invisible Man was a part of the league, but Hawley Griffin was not the invisible man. Griffin had died like he did in Wells' book but the thief Rodney Skinner stole the invisibility serum and used it. Tony Curran played Rodney Skinner in the movie.